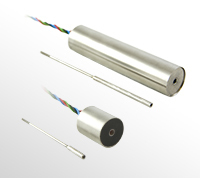 The Series 240 High Output DC LVDTs are Trans-Tek's mostwidely used product. The ease of use, high accuracy, and ruggedness make this transducer the right choice for most industrial environments. The high DC output voltage can be used directly into a PLC, A/D Board, or Digital Volt Meter.